No upgrades, per se, unless you count the Trac-Lok as an upgrade (which I do, since it came factory with open diff). Fired it up over the weekend to hear it run. Love that truck. Can't wait to get it back on the road, but when I do a job I do it right so I'm not taking any shortcuts. All new brakes, ujoints, shocks, painting any of the parts that went through electrolysis. Cant wait to see it all done sounds like its gonna be nice!! Back at it everyone....pics to come tomorrow. Starting to set up the ring & pinion. All the external work is complete. Chased threads in axle housing (cover bolts), installed races for pinion bearings, installed axle bearings and seals, pressed on diff carrier bearings. Made a pinion flange holding tool from some scrap. Got my first gear pattern witness. Great heel to toe contact. Set backlash dead on to .008". Looks like the pattern is sitting high on the tooth though. Bring pinion further towards ring gear? What is a good estimate for a starting shim to get the pattern to shift closer to the root? After looking over tons of images on the internet, it appears that the pattern I have is a lot more pronounced, possibly indicating that the pinion is too close to the ring gear. 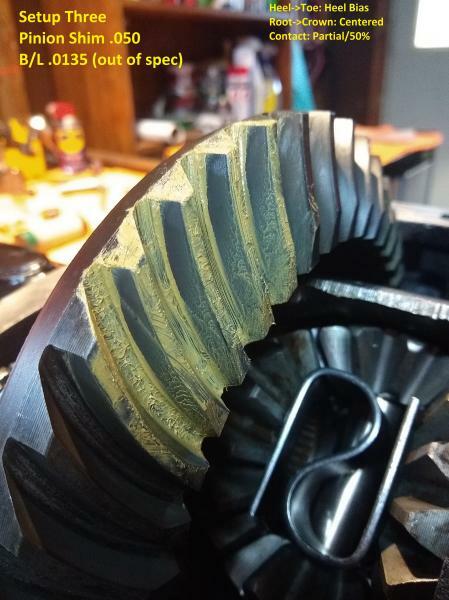 My original pattern that I took pics of before I removed the old ring and pinion looked almost identical though. TO ME only setting up one in my life but being a machinist by trade I think your pinion was too far forward originally and looks great now. If your lash is set to .008 that means there is room for lube. Are you sure about the .008 it looks like the ring and pinion are almost touching? If it is truly .008 (did you do that by adjusting shims to the right and left of the carrier?) I would leave it where it is. Need dreaded sled or possibly V8 level2 in here for a second opinion. Maybe 410 has set a few. Yep, it's dead nuts .008-.0085 checked in four locations. 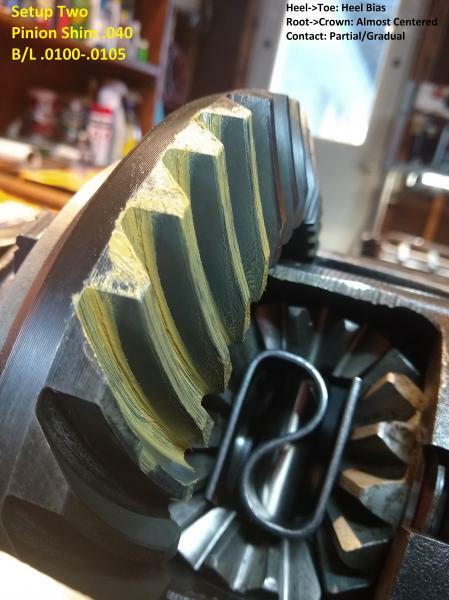 My first drop in with factory cast shims had it at .011 so I tightened it up a bit (shifted .006 over to the ring gear side) which brought the pattern down ever so slightly from the face and brought backlash in the tight end of the spec. The contact pattern is just very pronounced, it shows contact over most of the heel->toe surface. Most of the indications I have seen of proper contact note a patch of full contact that is smaller. But again, I am new to this and don't have the intuition or the experience so I'm just using common sense. New ring and pinion set? Because if so, the brand may play a major part in those witness/contact marks being so elongated. I forget which brand it was, but many Mustang 8.8 owners were having problems with ring/pinions having a major howling noise after correctly setting up the gears. Most believed it was that manufacturer and the cut angles they were using, or worn production machinery. Moved pinion further towards ring gear. Brought the pattern down slightly, made backlash a little tight so I opened it up. Shows more bias towards heel on drive and toe on coast now, but it is more centered root to face. Drive side comparisons on the three different setups. Keeping backlash in spec was not possible on setup three with the .010 shims that came in the kit. I'm not tied to setup three anyway, just included it for reference on how the pattern is shifting. My gut instinct is that setup two is the best of the three. Any input on the patterns? From opinion, setup 2 seems more logical. BUT even though .004 extra might take it out of spec (as in #3) in one of the tests, you have no idea how close to "specs" the ring or pinion were milled/rolled/ground whatever method they used, and you have no idea how close the bore of the pinion shaft area is to your axle shaft bores as far as an intersection point. The backlash I would place dead last in the importance of the collective criteria. ALSO once they wear for a while the contact should actually get better (I've noticed this with gears in lathes and presses) but the backlash will suffer slightly. 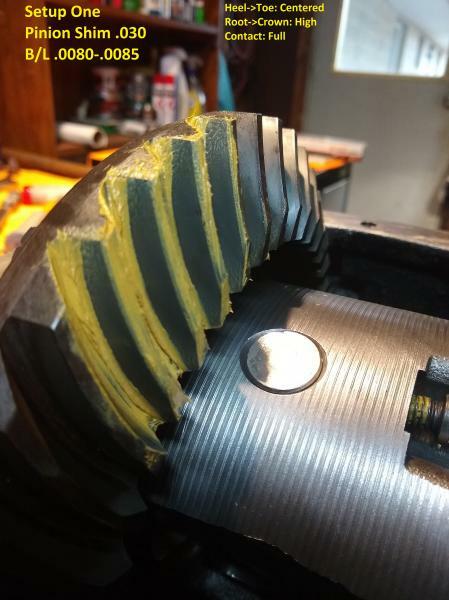 I don't know how it equates to backlash but I have seen pinion slop where the driveshaft would move about 5 or 6 degrees before engaging fully without any noticeable clunk while driving and coasting. I can see the logic in your suggestions. I would like to add also that one of the things I've been going for is to match the factory lapped pattern present on the ring and pinion gears. My thinking is if you can keep it close to that same contact area in all dimensions and keep backlash as close to spec as possible, then it should provide some longevity. Page processed in 0.2742 seconds (19% database + 81% PHP). 130 queries executed.